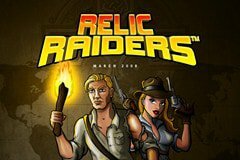 If you’ve always been fascinated by archaeology and the hunt for long lost relics now is your chance to join a team of Relic Raiders on a quest to find four ancient gold relics that are hidden in tombs – with lots of treasure to unearth as you can win up to 200,000 coins each and every spin! The Relic Raiders slot machine has clearly taken inspiration from the adventures of Indiana Jones as you and the other treasure hunters navigate your way through dark caves where you will hear the echoes as the reels stop spinning and the sounds of bats flying overhead, but it’s well worth being creeped out as there is all sorts of valuable gemstones and gold relics to collect. The adventure takes place across 5x4 reels and offers 50 paylines which can be adjusted, however the stakes may be a little high for some of you as they range from 50p up to £100 and it also offers a very poor return to player percentage of 90%! What Lurks in the Caves? A creepy Witch Doctor will guide you to the caves full of relics, and as frightening as he looks, you’ll be welcoming him on the reels as he is the Wild symbol, with him appearing five times on a line resulting in a 10,000-coin win. The treasure chest is how you earn Scatter pays while the Relic Raider characters are the Bonus symbol. There is also an aeroplane which transports you to the middle of nowhere to hunt for treasure, an ancient book and map to locate the relics, a monkey who guards the gold coins, a venomous King Cobra, plus an assortment of gem stones with diamonds, rubies, emeralds and sapphires to collect. There are all sorts of relics to discover on your hunt through the dark caves, however there are four special golden relics to watch out for in order to enjoy the greatest wins of all. You’ll notice that there are four empty eclipse positions to the left of the reels and your task is to find each of the gold relics to fill them. While that may sound like an extremely tough task, Net Entertainment assist you by saving your progress for 36 hours after your final spin, therefore if you come back to hunt for more relics in that time you’ll have the ones that you already found available on screen. To discover the gold relics, you will need to gain access to the deepest cave where few have ever tread and you can do this by landing the Bonus symbol on a single payline consecutively on the reels - for example on the second, third and fourth reels on the same spin. This activates a second screen bonus game which sees you presented with a map that has four historic locations on it. Each of these locations contains a tomb and whichever one you select you will be taken to it where you begin smashing items that are inside in order to discover the long lost gold relic. The urns that you reveal will see you win cash prizes should you not manage to discover a gold relic, however you certainly don’t want a giant spider to appear or you’ll be running out of the cave in fear and this sees the bonus feature end. If you do successfully manage to acquire all four of the gold relics you will then have to choose a statue which will reward you with a huge bunch of gold coins which always makes the adventure well worth all the effort! The Relic Raiders slot machine also boasts a free spins bonus feature that can be triggered by finding three or more of the treasure chest symbols (Scatter) on the reels at once. Rather than being presented with a predetermined number of spins like happens in so many online slots, Relic Raiders sees you click on each of the treasure chests that you have uncovered in order to reveal the total number of free spins that you have won. In addition to this you will receive a multiplier bonus worth between 1x and 5x, plus it is very easy to re-trigger more free spins as you only require two or more treasure chest symbols rather than the minimum of three that are required to initiate it. You’ll be glad you joined the hunt for the ancient gold relics as you will be very well rewarded for discovering them all, but even if you fail on your quest there is lots of treasure to grab hold off along the way. For another marvellous treasure hunting quest you should check out the Great Adventure slot machine from Euro Games Technology too!